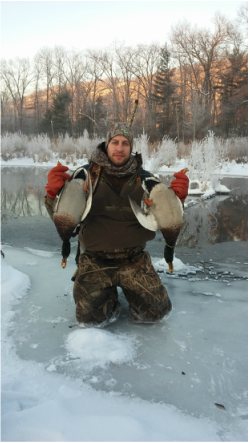 ABOUT US - Waterfowl Creations "Award Winning Taxidermy"
Hello, My name is Gary King and I am the owner/operator of Waterfowl Creations. I believe that my obsession for waterfowl and my passion for the outdoors has helped me become the artist I am today. I mounted my first duck over 15 years ago, and have been hooked ever since. I started competing in 2006 in the Professional division and have worked my way up the Division of Excellence, winning multiple major awards. I come from a family of avid waterfowl hunters and hunt across the nation. Whether I'm chasing Sea ducks in the Atlantic ocean with my brother, Captain Steven King from East Coast Waterfowlers, or trying to sweet talk some green heads in the cedar swamps of Louisiana...... It makes me what I am!!! We strive to give you more than the average bird mount by using top quality components and techniques for your trophy to last a lifetime. We offer artistic habitats and custom made glass cases that enhance the overall memory of what we all love!!! Check out the photo gallery for some examples of our work. Enjoy the site and feel free to contact us with any questions!! !